Yellowtail kingfish from the Waimakarii River mouth. Photo courtesy of Keith Gallagher. Although we are unsure about the identity of the angler one thing is certain; he is a very good fisherman. 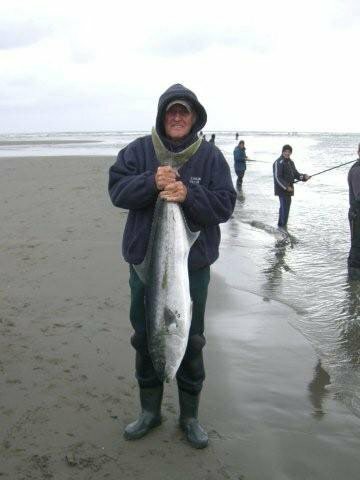 He landed this big yellowtail kingfish on salmon/kahawai gear whilst fishing at the mouth of Canterbury’s Waimakariri river, on 6th January 2012. The big kingi was taken on 20 lb monofilament line and a little 28 gram zed spinner. 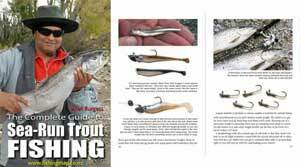 This is the standard tackle and lure used when salmon fishing. The kahawai are chasing baitfish including sprats and silveries. Kingfish are chasing the kahawai. All a case of eat or be eaten. There have been large numbers of kahawai off Canterbury river mouths this summer. I haven’t seen them in these numbers for some years. Kahawai are a great fish to target on light line being powerful acrobatic fighters. In an update (2016) to this article kahawai have been present over the summer months in Canterbury in increasing numbers. This is great to see! A few kingfish are caught on rod and reel each year in Canterbury. But it is very unusual for one to be taken at a river-mouth by an angler spin fishing for kahawai or salmon. Some kingfish are taken by boat anglers fishing out of Motunau. I have also had reports in recent years of yellowtail kingfish being taken in Otago Harbour. Could this be the result of warmer sea temperatures? Perhaps there is another reason for the increase in numbers of kahawai around the South Island over the past decade. Congratulations to the angler. He is now a member of an elete group of anglers having caught a yellowtail kingfish at the Waimakariri River mouth on light gear. Kahawai anglers at the Waimakariri River mouth. There must be more yellowtail kingfish out there somewhere! A few Canterbury anglers are now targeting them at this location. Anglers fishing for salmon during a fishing contest held in the tidal reaches of the Waimakariri River back in March 2012. Salmon are the premier sports fish in Canterbury. Catching them regularly requires experience and persistence.